We are a very serious enterprise ! He sings Contrapunctus 1 of J.S. Bach's "Art of the Fuguee". Please compare with Walter Riemer's fortepiano -CD, also available on YouTube (without any singing!). Is that funny or even exhilarating at all ? 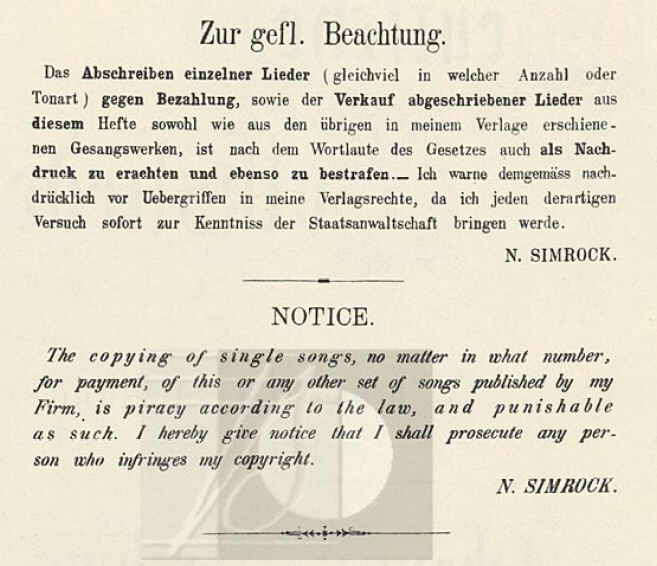 Today, copying of printed music is forbidden - in old days (1894) even copying by hand was not allowed (except maybe for personal use). Elisabeth Kulman, superior Mezzo/Alto, collects on her Website http://www.kulman.info/ mainly audio documents of singer mishaps, such as Florence Foster Jenkins (famous daughter of a millionaire who even performed once at Carnegie Hall). Visit http://funstuff.kulman.info, you will certainly not regret it! 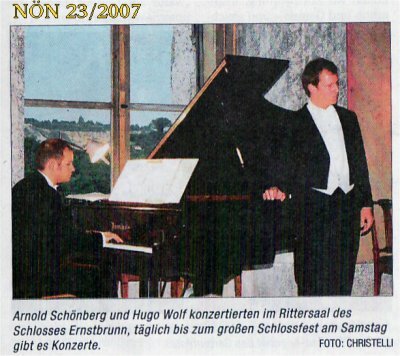 "Arnold Schönberg and Hugo Wolf in a recital at the Knights' Hall of Ernstbrunn Castle, every day until the Castle Celebration on Saturday there will be concerts." We were not aware that the two mentioned musicians are still in such excellent shape and must regrettingly admit that we were so far not successful in having them in our place. 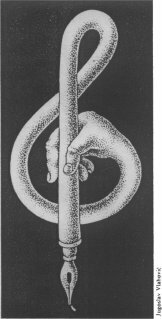 This is the image from the title page of a chamber music guide of more than 1000 pages (we rendered the publisher's name unreadable for fairness reasons). 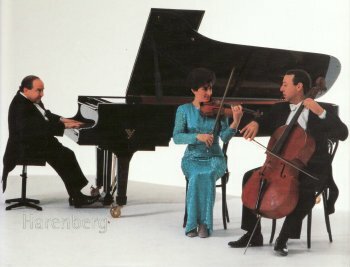 We would like to assure you that none of the numerous piano trio ensembles we have been having in Niederfellabrunn has an appearance like this! A translation of "Wohltemperiertes Klavier" from German to English, done by the Google language tool read: "piano well-being-kept at a moderate temperature". It should also be mentioned that "J.S. Bach" was always converted to "J.S. Brook" and "Alban Berg" reappeared as "Alban Mountain". 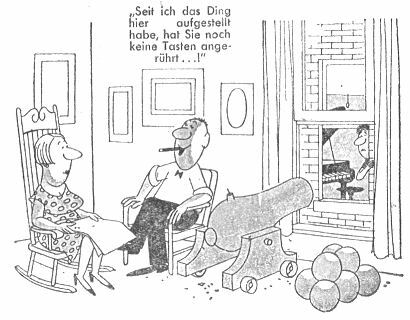 "Kunst der Fuge" was infallibly "Art of the joint". The English word "Fugue" seems unknown with Google. 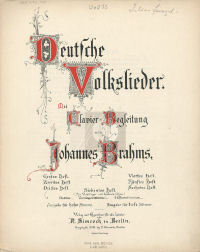 Another master piece is the translation of Bösendorfer-Flügel (Bösendorfer Grand Piano) to "bad village wing". Supplement, December 2008: Google seems to read our web site and follow our suggestions: Nowadays Google seems to have become familiar with defined terms and fails only with "Wohltemperiertes Klavier": Well piano (??? ); the rest is done pretty well: Kunst der Fuge, Johann Sebastian Bach, Alban Berg, Bösendorfer piano. 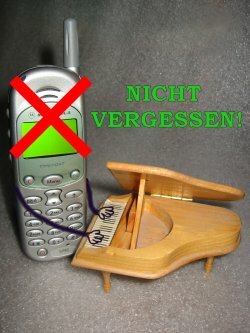 After years of "Handymania" in Austria, in the course of the Season 2002 it occured for the first time that a cell phone announced a call during a concert, initiating hectic activities of the owner. 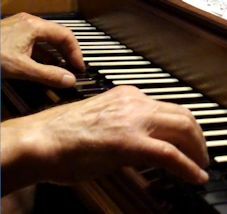 The musicians took the chance to request the phone be tuned to E-Major or A-Major, respectively, to guarantee harmony with the following movements. Daughter Stefanie designed this some years ago, when mobile phones looked like this. The following is also taken out of life! 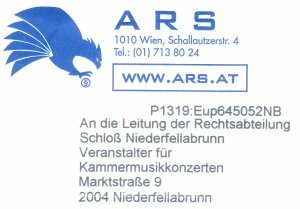 An address bureau seems to have sold our address to ARS (a seminar enterprise). Consequently we received mail to be given to the chief of the judicial department. Naturally, we complied with the wish of ARS. 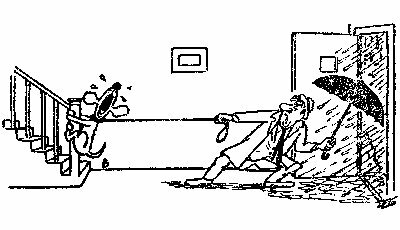 With the situation illustrated here unfortunately many of our young musicians are frequently confronted. Fortunately rarely with such drastic consequences! Since I set up this thing here she hasn't touched a single key! *) The five years are: 1944, 1963, 1969, 1973 and 1999. If your piano becomes defective during any one of those five years, return in the original carton, along with a self-addressed prepaid return carton to our factory in Hong Kong. Be sure to include the piano bench and the person or persons who play the paino. Allow two years for return, and keep in mind that a trip to a faraway place like Hong Kong is very bad for a delicate musical instrument like a piano. Please be assured that incidents like that NEVER happen in our place! 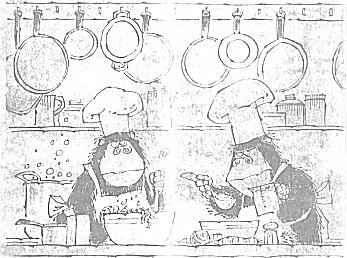 For reason of hygiene the sandwiches served never were in touch with any human hand! Our concerts are not really fascinating for dogs. Bad weather, however, should not induce you to abstain from visiting our concerts. Please leave your four leg companion at home, though! Virtually everything (except scribbling down reservations that come in by phone) runs over our computers. 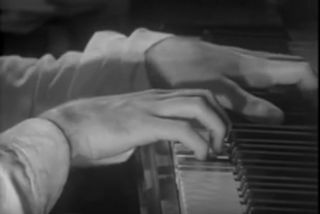 We want to avoid developing a crooked hand; the damage done to our hands through playing the piano, the violin, the oboe, ... is really enough!